Favorite Trail: West Branch or VK, or which ever one I'm on at the moment. Songs: Rudimental "Not Giving in" or engine noises. Description: Chubby, middle aged, awkward Englishman with incredible socks. Why I ride: Outside of the bedroom it's the only time I get to slip into a revealing, skin tight, brightly colored outfit whilst wearing socks. Riding mountain bikes is also pretty much up there with the most fun things you can do in life. If I didn’t mountain bike what would I do with my spare time: Pogo sticks. I saw a video on YouTube, there have been some serious developments in Pogo technology. 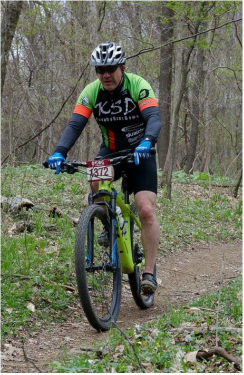 Who I Am: Wiry, government accountant that discovered mountain biking half way through his career and now dreams of retiring early to explore/ ride full time. 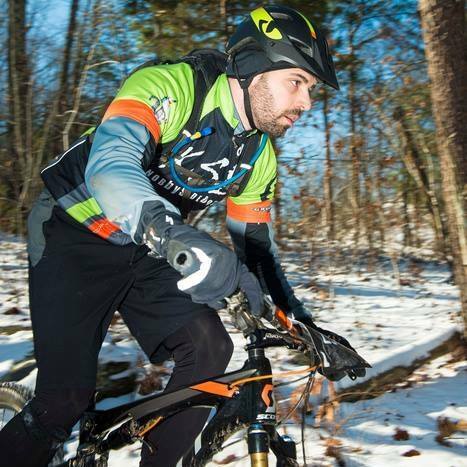 Why I Ride: I love bikes, trees, trails, being fit, challenges and going fast. Category: Sport - OMBC, Expert otherwise. Ride: Specialized Epic Carbon, Jamis Dakota Team (for sale ), Specialized Fatboy Carbon, Specialized Diverge. 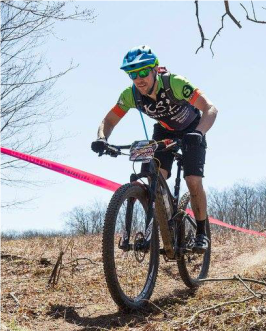 Mtb Goals: Sub 6 hr Mohican 100k, Sub 2:25 Mohican State Park Race. Maintain lifting throughout the season. Spare Time? When I’m not working or riding the rest of my time is spent with my amazing wife and kids, playing the 2002 Conquerors version of Age of Empires or watching movies and re-runs of The Andy Griffith Show and Star Trek the next Generation. Best Achievement on a Bike: BRECK EPIC!!! 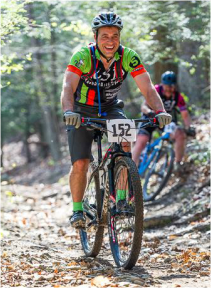 ​Biggest Fear: Lisa's "teacher voice"
Favorite Song to Sing When Riding: Madonna - "Vogue" and Christina Aguilera - "Genie In A Bottle"
Home Trail: Camp Tuscazoar (Trail Steward since 2014). Favorite song to sing when riding my bike: Whatever is playing on Pandora in my ear and occasionally songs from the Frozen soundtrack. 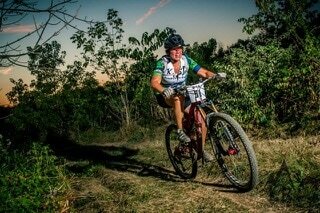 Best achievement in a bike: Winning the 12 hours of VK solo! Best Achievement on a Bike: Changing my flat tire with frozen hands on the second snake race! How long have you bean riding? Over 35 years. I pulled my first wheelie at 7 years old. Biggest achievements on a bike: Getting up after a crash. Favorite quotes: Those at the top of the mountain didn’t fall there. / If we are growing, we will always be out of our comfort zone./ Every day is an adventure!/ I’ve found the key to happiness, stay away from assholes. Worst time on a bike: Attempting to ride to Geneva with the girls: the brink of hypothermia! This resulted in asking a stranger to rescue me! 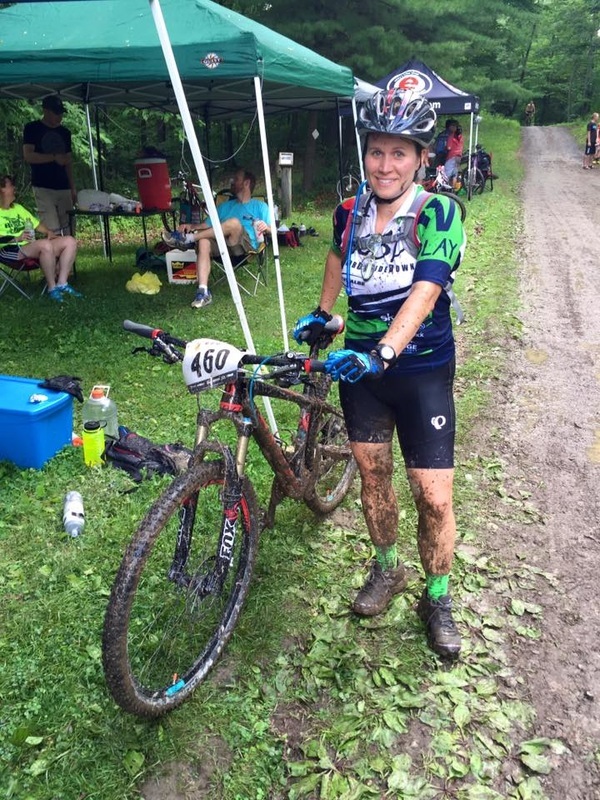 Biggest achievements on a bike: Finishing 2 Mohican 100K’s with Corianne! / Finishing the first Snake Creek Gap time trial with Corianne ! Post race beverage: Anything but an IPA! Favorite trail: Pilot Rock and any route Josh makes! "You can't buy happiness, but you can buy a bike and that's pretty close"
Biggest Fear: I'm not scared of anything on 2 wheels, but when I'm not on a bike, heights are scary. Handsome, Debonair, Most Interesting Man in the World, DWM ISO SWF w/Mtn Bike Talent and a thirst to ride. 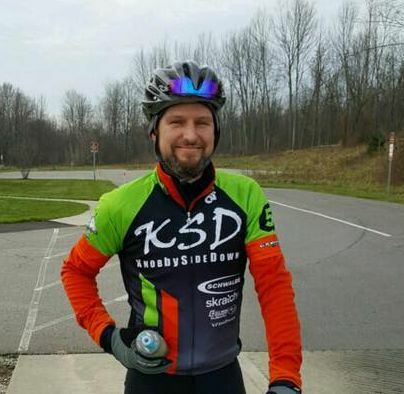 Age: Older than anyone else on KSD with tons of talent and longevity in and out of the saddle. Wink wink. Best Times On A Bike: Riding with the people I like. 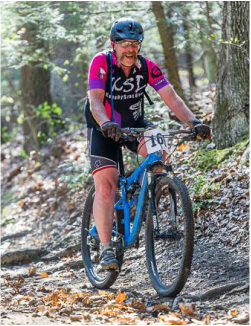 Oh yes, riding Mohican State Park, smashing head on to a tree (literally) just before mile marker 3, finishing the 24+ miles, 12 stitches, 3 fractures in my face. 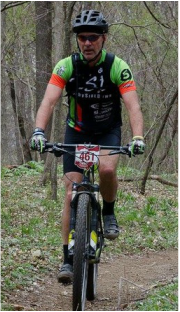 Great time while riding on Racing Ralph's #rideschwalbe. 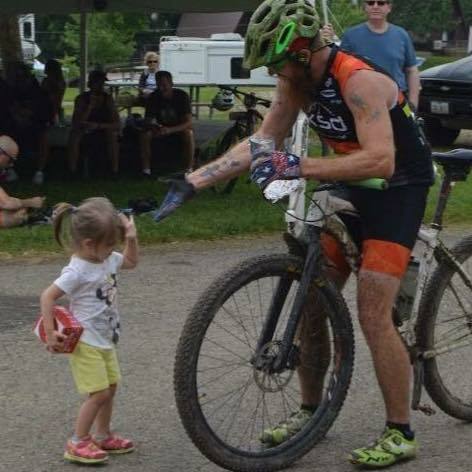 Also 2015 Mohican 100 mile race; coming in to the finish to a crowd cheering for me that could be heard a mile away. ​Worst Time On A Bike: Absolutely None! Years Riding: I get asked that a lot. Hard question to answer, I guess since I was a child and got my first bike. Duh! Favorite quote: "If you're in control you're not going fast enough" -Gee Atherton, and "No dig, no ride!" Number of Bikes owned: Not sure, I have some serious issues according to my wife. Years Riding: I'm not sure. It's hard to remember a time in my life when bikes were not involved in one way or another. 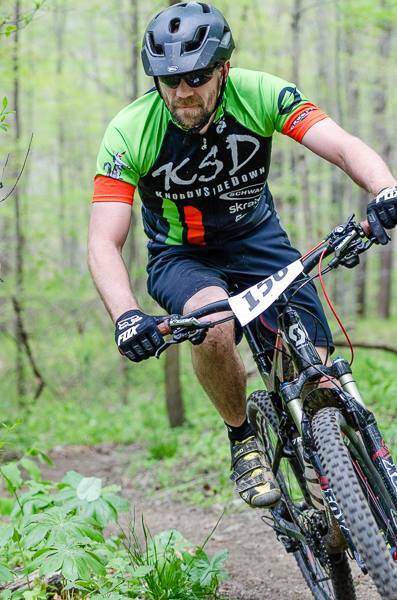 Favorite Trail: Vulture's Knob, Mohican, and Raystown. Best achievements on a bike: Queen of the old pump track at Ray's so many times, you'll never beat my record because it's gone! Goal for the year: To ride in the warm Alabama sun as much as possible. Pet Peeves: People who ride the trainer in the winter, I'm out ALL year in every condition! 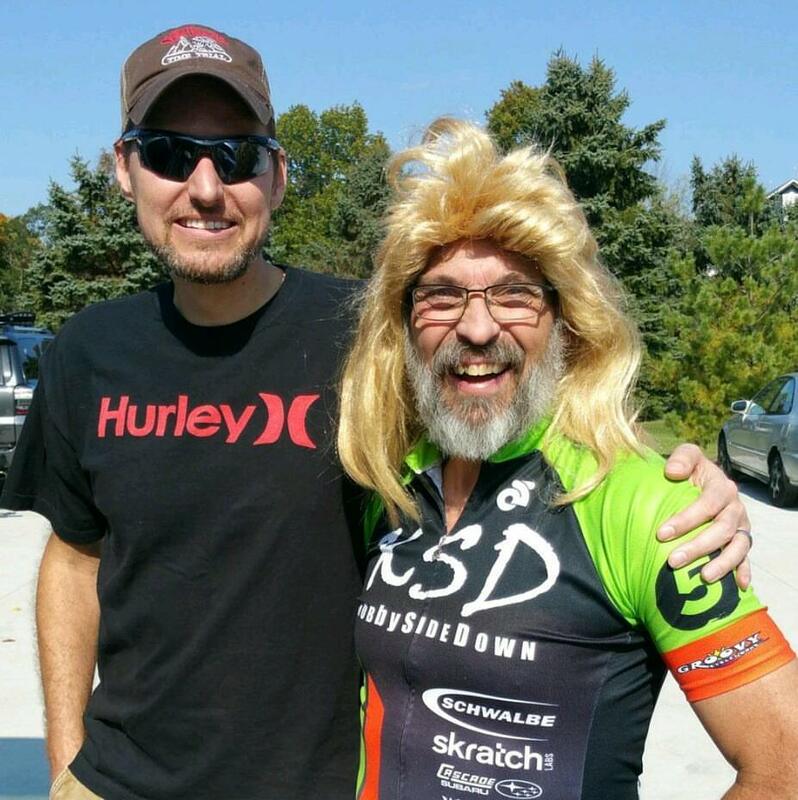 The KSD team and my husband made sure I got across the finish line. I will never forget that. Best Advice from Teammates: “Be safe out there, we can replace your bike not you”. “Lean forward and grab your front brake. 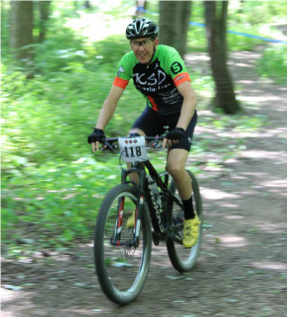 ” Advice from my amazing husband for tackling those tough downhill sections! Biggest Fear: Forgetting to start Strava before I ride. People, the fear is real! If it’s not on Strava it didn’t happen and I want credit!! Pet Peeves: Mud, wet socks and people who don't like to talk about bikes. Also I love "motivating" my wife by telling her to work harder while on the trainer. How many bikes do you own: 4 (multiple bikes = awesome wife) it could be 6, I might be hiding some. Other Hobbies: Long walks on the beach with my wife. Best achievement on a bike: Not letting my wife out climb me on a training ride in Mohican country. 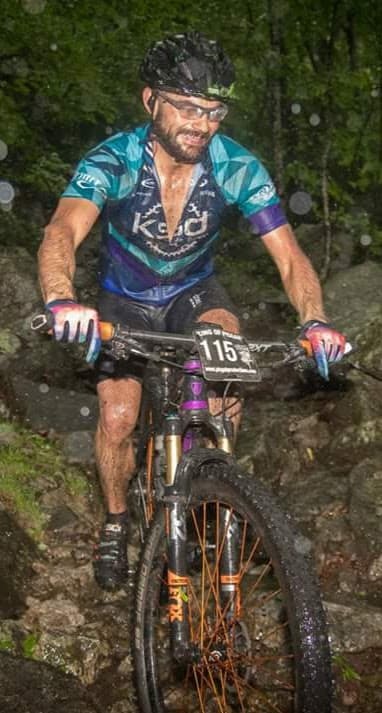 Favorite Trail: Tuscazoar, Rothrock, Pinhoti (anything rocky), Carabasset Trails in Maine! 2018 Goals: pushing myself, staying positive and having fun with a great group of KSD ladies! You never know what we'll come up with next! Looking forward to most in 2018: A lot of rad adventures! Post race beverage: Hard Cider!! Other Hobbies: Baking!! Brings me joy!! Favorite Trail: the Bike and Hike between Graham Road and Hudson Dr.
How many bikes do you own: I don't really own any. I borrow the one I ride from Cassa. How many bikes do you own: Like I'm going to admit how many bikes I own. What are you scared of: "Only two things scare me, women and the police." ​ "Smokey and the Bandit"
Ride: Giant Anthem & Trance. Favorite Trail: Brown County so far until I’m able to explore more out of state trails. Post Race beverage: Most any hard cider, it’s what us sissy’s drink. How long have you been riding: Long enough that I should be better, but I have another 50 years to train. How many bikes do you own: Only 4. I haven’t bought a bike in over a year and have no desires to. I’m cured of N+1 for now. Category: Is there a Pre-Beginner Category? Other Hobbies: Who can afford another hobby? 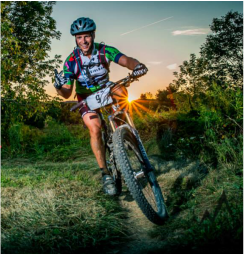 Best achievement on bike: Finishing the Mohican 100 mile in 2015! Post race beverage: Any cold brew will do. How many bikes do you own: two, I was a good boy for Christmas! Post Race Beverage: I.P.A Baby! Post Race Beverage: PBR, do you know it won a blue ribbon? Favorite Quote: "you can do anything for 30 seconds,"
Best achievement on a bike: Winning the VK 24 hour race with my team! Category: Sport and maybe I’ll dip my toe in the Expert pool. 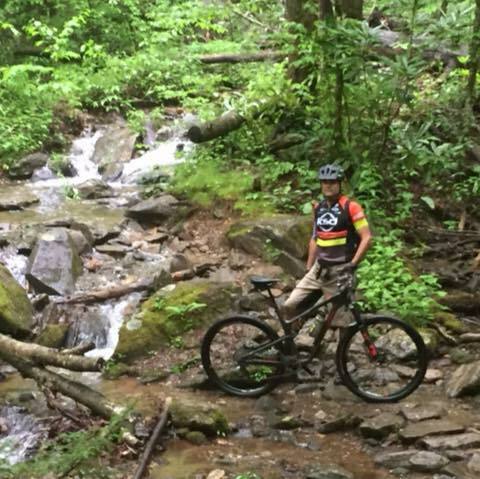 Favorite Trail: Green’s Lick in Asheville, NC. Post race beverage: I keep trying to kick energy drinks but I love them too much. Also beer. Favorite quote: That’s what she said, All aboard the struggle bus! It’s time to nut up or shut up. ​Favorite Trails: Lake Hope, Brown County, Ind, Air strip. Dupont, N.C.
Biggest fear: Not finishing a long ride that Kenny designed! 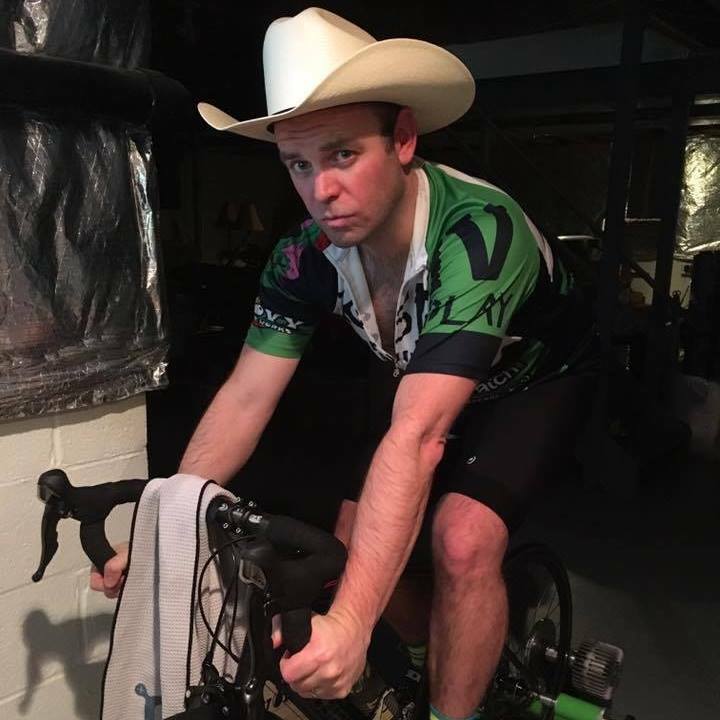 Goal for the year: Finish every ride I start with Kenny! Age: 47, I think I’m the oldest female on here. Category: Expert….. expert legs and skills….sport lungs. Ride: Pivot MACH 6, Soma Hardtail. Favorite Trail: Raystown! (Osprey). As long as I’m on a trail I’m happy. Quotes: Nothing ever happens in your comfort zone. Song that comes into my head while riding: No room for songs…. Me, Myself and I are talking while I ride.